Do you have a passion for cooking? Have you ever entered a cooking contest? Ready to try one? Our friends at "Tuttoroso" are doing a fantastic recipe contest. Between Jan. 14 and Feb. 8, Tuttorosso will send an apron to each of the first 4,000 to 'like' Tuttorosso at its Facebook page and also provide their favorite and original Italian recipe. In addition to the free apron, it's also a chance for home chef fame, as the top four recipes will be highlighted on Tuttorosso's Facebook page and website, and will also be printed on future Tuttorosso cans. Plus, one grand prize winner will receive a $500 gift card at cooking.com. People can enter any original Italian recipe, be it main dishes, casseroles, soups our appetizers (but needs to be more than tomato sauce, which would not qualify for the apron or contest). Just a few rules on the recipe: It must include a minimum of One Tuttorosso product, original and not copied, must list ingredients in order of use and in standard U.S. measurements, and must include a photo of the finished product (photo of Tuttorosso can is optional). 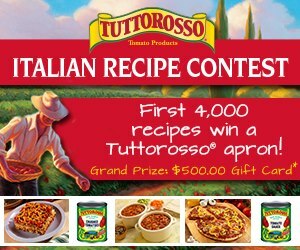 To enter, folks can just click on Tuttorosso's Italian Recipe Contest tab, and 'like' the brands page, and then complete the form. 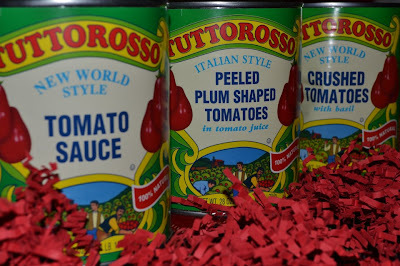 If you are not familiar with Tuttorosso Tomatoes let me tell you they are the best canned tomatoes on the market. Tuttorosso tomato products are made in America, all natural, preservative free, gluten free, and packed with antioxidants, vitamins and minerals! Tuttorosso is made by Red Gold, the largest privately held tomato processing company in the United States! I personally use this product almost every other day. 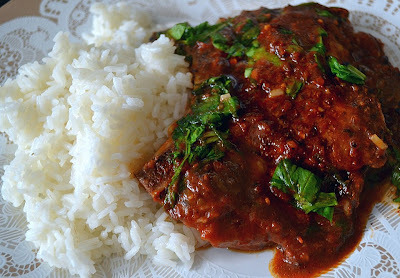 I use their sauces to bake eggs, in stews, in my meatloaf, and of course in anything that involves braising. Once you try this product you will always come back for more, and let's not forget this is a 100% USA product! Sprinkle pork chops with salt, pepper and sweet paprika. Add shallots and sautee for about 10 minutes. Add Tuttorosso crushed tomatoes, 1/3 beef stock, a hint of oregano and thyme, cover and let simmer for about 40-60 minutes until nice and tender.